New official authorized version by the Prouve estate, produced by Vitra germany. Designed in 1949/50 by Jean Prouve. In the early 1940s Jean Prouve turned his attention increasingly to wood as a material. 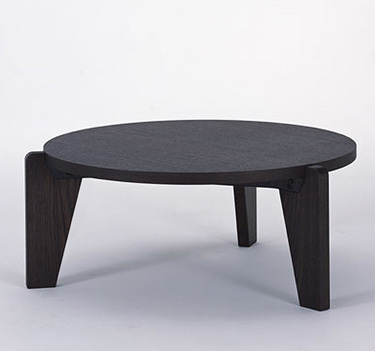 In the case of the Gueridon Bas coffee table a sturdy top is positioned on three solid oak feet. The elements are connected to each other by means of a folded sheet metal construction. Referencing a tropical wood version of the time entitled “Table Africaine”, this re-edition is available in natural or dark oak (pictured). The Gueridon Bas table is suitable within the domestic context as an oversized coffee table. It is also suitable for commercial projects. Material: legs made of solid oak, table top oak veneer, natural or dark stained, natural effect varnish.